~Even when some part of sea ice column is always warmer than air (during winter). ~Sea ice horizon never been observed below Astronomical Horizon has now an explanation. Strictly by several years of observations, a visual correlation was made with temperature profiles from sea water to upper air related to physical conditions of the horizon. 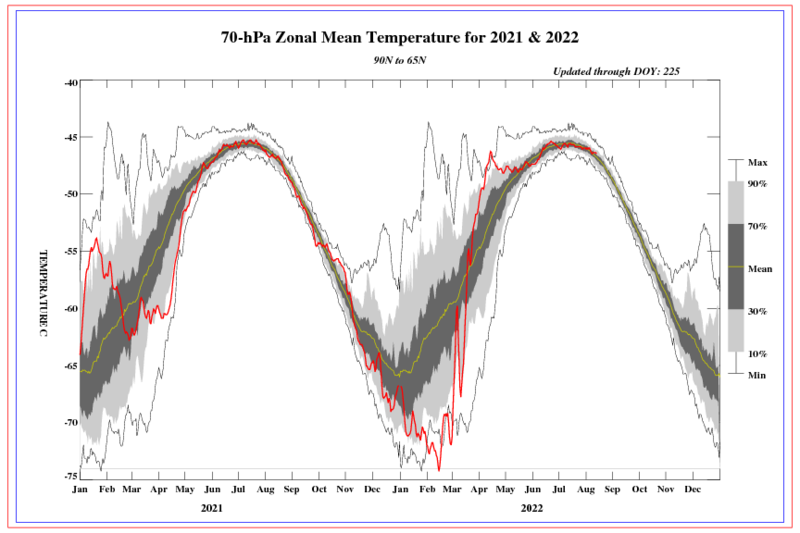 Notice top of sea ice temperature was never observed warmer than the air immediately above. Only with the presence of sea water does the horizon elevation drop below the "Astronomical Horizon" ( orange line). The Astronomical Horizon of any planet Earth location would permanently remain at the same unchangeable altitude if our planet did not have an atmosphere. 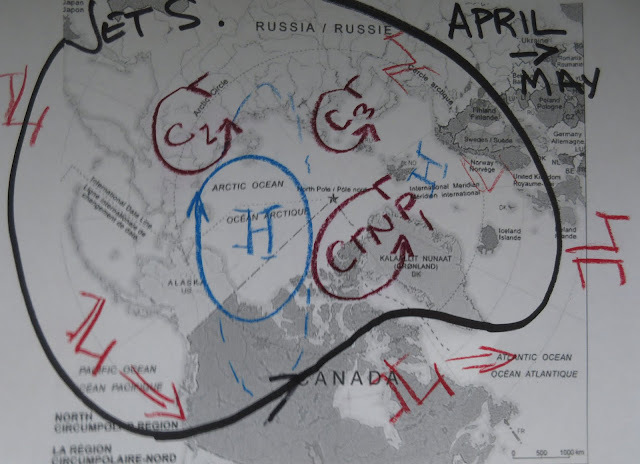 Many years of sea ice horizon observations gave a proposed theory written here and here. The biggest feature of sea ice horizons happens when the sea ice horizon stops going down, does not go below the Astronomical Horizon, settles there until the sun lowers in the sky to set, only to spring up higher again. Its the spring time great steady "LAN" horizon which may happen daily for a while after Local Apparent Noon. When so, the temperature profile at interface between ice and air temperature is isothermal. This feature also makes it possible for well informed sea Navigators to recognize the presence of sea ice without radars. Buoy 2015F August 13, 2015 to April 19 2016, 4 hour interval surface temperature (in blue) Thermistor 5 (in red 50 cm down). Temperature of sea ice was always Greater or Equal to surface air, except for a few very rare interesting occasions. 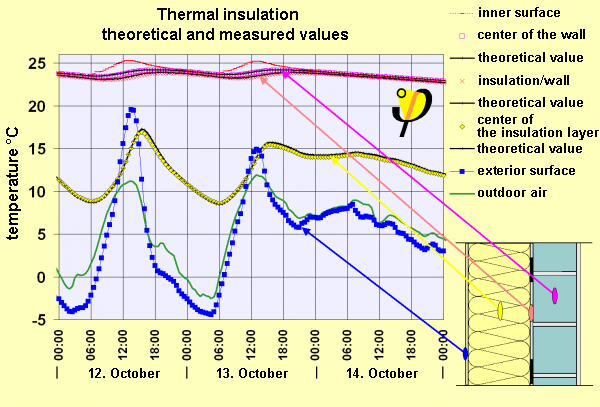 Physics replicates itself with different matter, in this case house insulation. Note in blue, top of insulation is always colder or equal than air except when too sunny. Consider sea ice as insulation, the same happens over the frozen sea. But also again identical with middle of sea ice column as with buoy 2015f graph above, center of insulation layer is almost always warmer than air, this is a good model proxy presentation for sea ice. 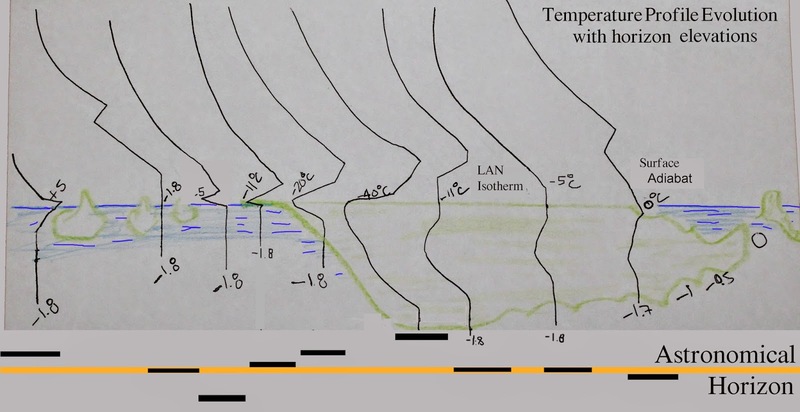 As observed optically following Local Apparent Noon (LAN) with the sun present, the temperature lapse rate of the surface to air interface appears to become isothermal over sea ice, the horizon is at the Astronomical Horizon. Considering an hypothetical, if top of sea ice would remain cold, unaffected by shortwave radiation, the horizon would remain higher than Astronomical Horizon. In Darkness 4 hr interval readings 2015l November 1 to 8 2015 1st thermistor called 31 (in blue) is always colder than surface air (in red). 2015l December 1-7 2015, always colder or equal. Top thermistor wonderfully matches optical physics observations well in darkness or spring. Likewise, I have filmed in darkness no ice horizons very close to astronomical horizon as in spring, the warming of surface to air interface occurs rarely during the long Polar night. 2015l January 1-7 2016, the data is overwhelming, top of sea ice is always colder or equal to surface air. [Or perhaps inside snow next to ice, but snow sensor did not seem operational]. Top of sea ice is always colder or equal than surface air, this is a profound conclusion from refraction observations. 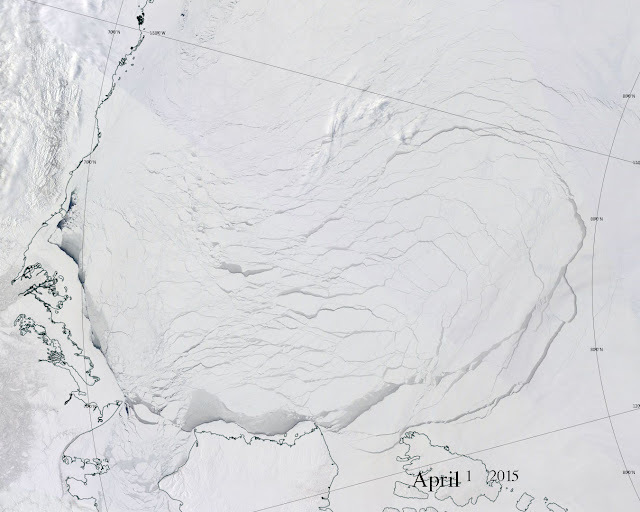 Adding a better view of the complexity of sea ice thermal physics. WD April 28 ,2016. ~ 2008 Big Blue repeat, cloud seeding theory confirmed yet again. The sun is of course a giant thermometer, not only a source of energy. Notice apparent lack of sunspots didn't cool anything though. Arctic deflated sun as seen through many atmospheres. The sun and Earth atmosphere are telling how hot it is anywhere on our planet. The same sun taken in the tropics at the same altitude would look a whole lot rounder. Rare near dead center lone sunspot is the signature event of this spring. Can you tell which suns as posted above were upright? Because it is so obvious, 2016 will be the warmest year in history despite a forming LaNina. which is the most lethal combination for the survival of the Arctic Ocean ice pack. Less North American tornados than average is expected because of collapse of cold air in the higher atmosphere, despite it being very cold during January and February just past. However there will be a return of Hurricanes hitting North American shores. Rain for the west Coast of North America will resume to more normal levels until September. Very hot summer temperatures for the middle North American continent will extend towards the entire East coast. NW Europe will be wet which makes it slightly cool, but drier cold fall. Eurasia and Western Russia super heat waves are expected. The potential for the North Pole to be sea ice free at Minima coming mid September has never been higher. 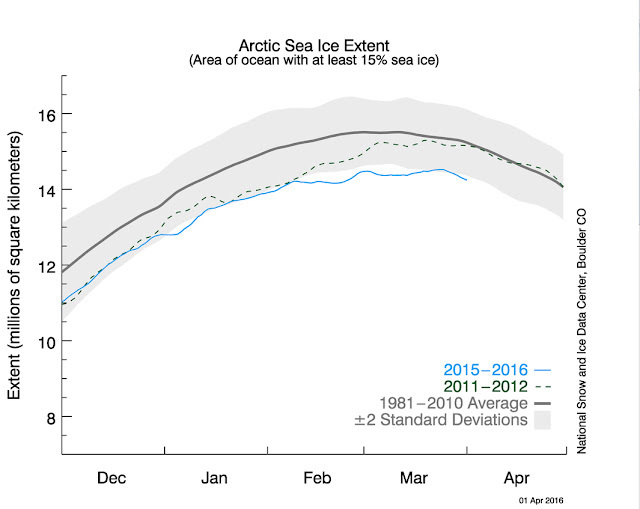 Arctic sea ice extent will be smaller than all time lowest record of 2012. Clouds will span less in all regions of the world favoring droughts and heat waves everywhere even where they don't usually occur. Winter coming will be at first very warm, becoming bitterly cold in January, and so will the sea ice recover rapidly but with far less multi-year ice. 2016 is #1 at 15.45%. 5th place 2012 7.27 %. 6.7% should be considered a normal year to year fluctuation of all time average vertical sun disk maximum dimensions. Data from 110 vertical sun disk decimal levels extending from -0.9 to +10.9 degrees elevations, including 540 observations, above normal year acquisition numbers due to no clouds currently continuing. With about 42 sun disk measurements per degree elevation, each yearly vertical sun disk average is compared between years 2002 to 2016 inclusively (15 seasons). What does this mean? Vertical sun disks are expanded in a tropical atmosphere as opposed to much compressed for a polar atmosphere. If there is a warming of the atmosphere in the polar regions, vertical sun disks dimensions have to expand. But not necessarily evenly at all sun elevations. The truer measure of expansiveness is clearly depicted by comparing vertical sun disk dimensions from year to year. Sun disks are another way of signaling over all temperature trends of the entire atmosphere from 2 times its actual vertical thickness to about 40 times. It is the most precise depiction of warming since it incorporates huge atmospheric distances, far more than any satellite or possibly radars. Year 2016 gave extraordinary results despite all time high levels of snow depth on sea ice and land surfaces. This snow dates back to October-November 2015. Laid out more than twice thick than normal. As a good insulator, thicker snow depth kept permafrost warmer and the sea ice thinner. It also made the rising sun ineffective in warming surface air. Despite more reflection to space, overall winter temperature averages were above normal. Not by much, but above average. Expanded sun disk dimensions mirrored the state of the atmosphere up to where the deeper snow had an impact. All time average highest expansion averages occurred 12 times between 10 to 5 degrees elevations and 4 times -1 to 4 degrees elevations. Moreover, the upper air above 5 degrees elevation has had many, the most numerous ever, exploded sun disk sizes especially in the critically usually very cold Northwest atmosphere from Southern Cornwallis Island Nunavut Canada. 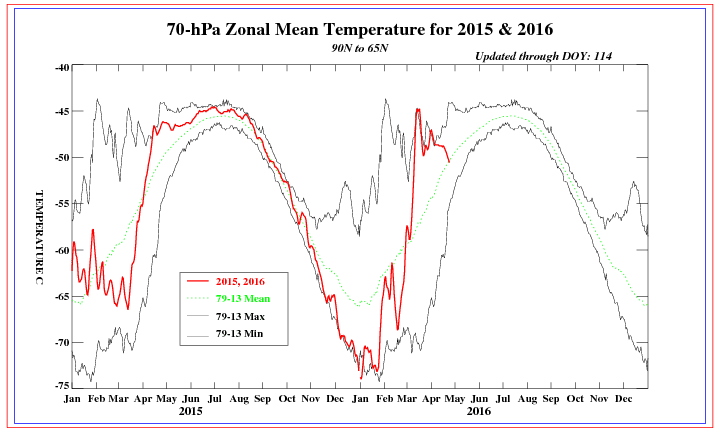 The coldest high atmosphere air seems to have collapsed or warmed substantially. This is a remarkable event and affects the outlook of coming weather everywhere over the Northern Hemisphere. El-Nino event just past was largely felt by more clouds during the entire Arctic long night. Unlike central Arctic Archipelago, the larger Arctic was found to be extremely warmed with large temperature anomalies easily more than 4 C in many regions. ENSO reverted quickly towards La-Nina lately. Replicating 2008 "big blue" event which was and consists numerous consecutive days without clouds. Interruptions of this years “big blue” was only by encroaching cyclones, there are no substantial cooling cloud spans about. At season end, mid May, there should be nearly the same amount of sun disk observations than during 2008. The 'big blue" event of 2008 had huge consequences for water puddles over sea ice. NOAA essentially confirmed the large warming of the stratosphere which was seen as unbelievable sun disk expansions, especially with sun shots captured at higher elevations. The latest bit of cooling was equally caught recently with the sun returning to more normal vertical diameters. The upper troposphere and stratosphere accounts to about 40% of sun disk refraction. The seen warming occurred at 250 mb covering almost exactly the Archipelago. But this was the same location where the coldest surface air persisted. Very much conducive to little clouds. A vertical temperature anomaly event from no clouds with deeper surface snow pack reflecting the gradually intensifying sun rays? Where is summer cold Arctic air going to hang out? 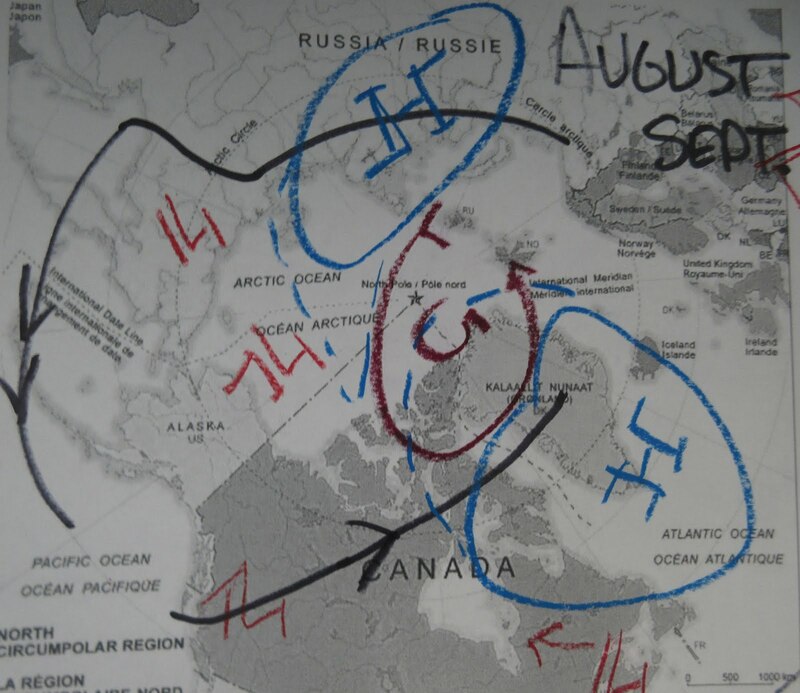 The imminent collapse of the Alaska to North Pole sector pack Ice will impact the jet stream. But there are other factors largely related to current La-Nina trending. Cloud seeding theory predicts less clouds for the Arctic when ENSO turns towards La-Nina, as it has already occurred, this favors Anticyclone genesis as has happened especially above the Arctic Ocean gyre area. Mid-April onwards should usually be a very cloudy Arctic Ocean sky, characterized with hardly distinguishable geographic and pack ice lead features perceivable by satellite photos. So far, this was not the case, reinforcing again a cloud seeding theory largely correct. But note, North Atlantic and Pacific Ocean SST’s were cooled for a prolonged time period because of the same cloud seeding reason when El-Nino was full blast, more clouds occurred over the Northern Oceans by enormous consecutive Polar Vortex cyclones. These cooler vast areas of sea water will have an important impact just as well. Past winter circulation pattern of North Atlantic to Pole cyclones favored a lot of moisture covering most of the Canadian Arctic Archipelago Southwards. This same pattern likely gave less snow for Central Northern Eurasia, very unlike winter 2014-15 huge transcontinental pattern. 3 distinct Cold Temperature North Poles (CTNP) vortices are expected. 2 will eventually collapse and only one will remain at sea ice Minima. The current Arctic Dipole will largely remain in place for 4 distinct reasons: Warm winter continued to spring with temperature to dew point ratio spread further apart, less cloud coverage because La-Nina trends, mesoscale CTNP Polar vortices favor a High Pressure between them, with descending air above the Gyre High much warmer than normal. 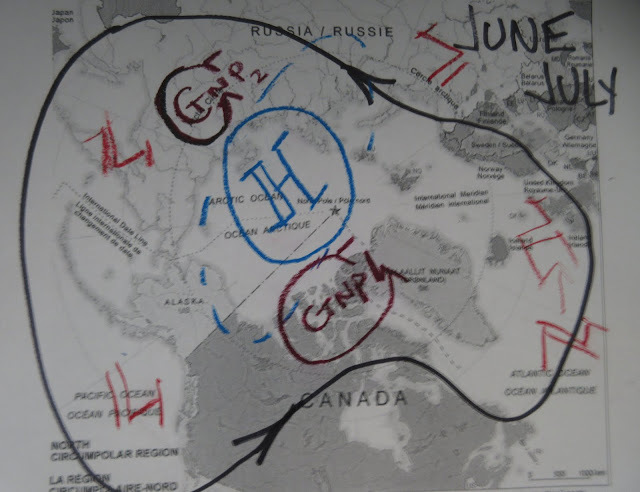 2 CTNP left with the largest wobbling like a top over the Canadian Arctic Archipelago. The Jet stream more or less similar to spring fading away along where the coldest land of sea surfaces are. Note the gyre High moving towards Russia mainly because of CTNP placement. Greenland largest ice with Ellesmere becomes the center of Cold teamed with what is left of pack ice , Cyclones now linger over the Beaufort Gyre. The big difference with last year is the diminished Polar jet stream not as high in latitude over the Pacific. I'd expect some major heat wave action North Eurasia along with great cyclone diversions NE american continent. ~Arctic surface snow depth turns out to be a very complex issue. the cloud seeding theory, the Arctic was covered with clouds during the long night, and so it was, not only cloudy but snowy, in particular during October and November (El-Nino Maximum temp anomaly). Snowfall was great, in some places multiple times the monthly average record. Ironically, ENSO driven heat causation making more snowfall created more sea ice extent than it would of otherwise. Snow spreads to open sea water either from sky or drifts, as it floats just below the sea surface, it doesn't melt since sea water is usually -1.8 C. This floating snow enables ice to form more quickly. Immersed snow is usually much colder than -2 C during Arctic winter. However if greater snow layer covers sea ice, the snow insulates direct contact of air to ice, the more insulation there is, the less heat loss of sea water, accretion slows a great deal more. In one case, snow helps create sea ice, in the other, it slows the build up of sea ice thickness. Complexities continue especially in the spring time when the sun reappears after the long night. The warmer winter just past gave a less parabolic sea ice extent graph feature , the greater snowfall must have also flatlined the maximum extent. There is also lesser melting of the thinner in ice blackish leads even with a full forced "big blue"
event outgoing at this time. Arctic big blue occurs when there is hardly any clouds for months, this usually happens when ENSO trends towards La-Nina. 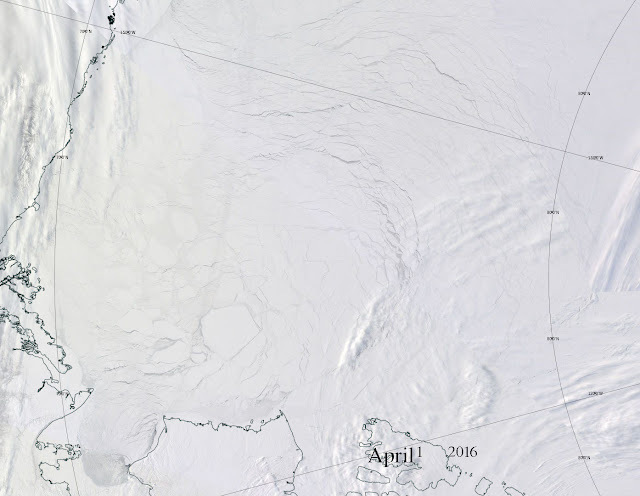 EOSDIS april 1,2015 North of Beaufort sea appeared broken, with many blackish leads and fractures. Although 2014-15 was a warm winter, this satellite photo of April 1, 2016 appears to suggest that the winter of 2015-16 was colder. But it wasn't. The illusion of less broken sea ice was done curtesy of greater snowfall and winds drifting snow on the sea ice more evenly. 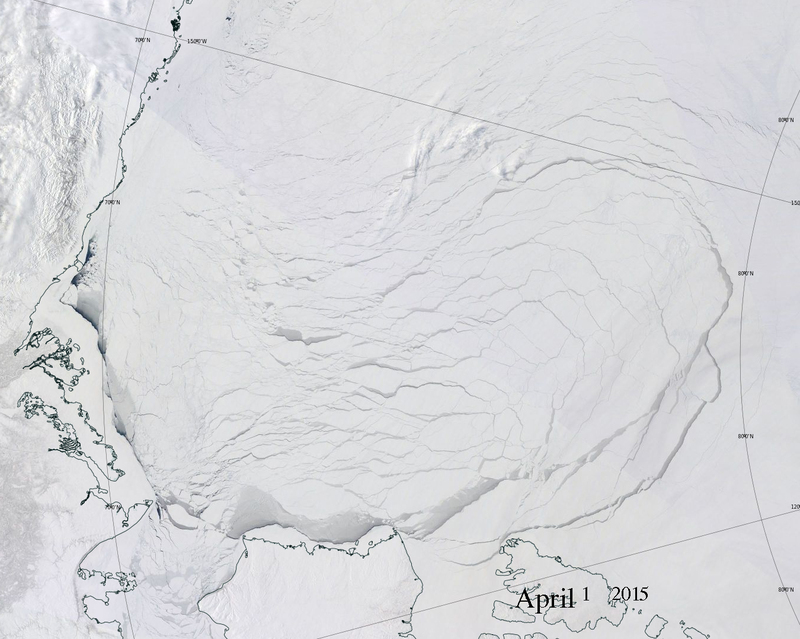 Spring 2016 sea ice is over all thinner than 2015 all the way to the North Pole. are not getting through to the ice as with a normal snow cover, and this affects the entire surface to air interface thermal physics of the Arctic with significantly more snow. Although there appears to be no graph available for snow on top of sea ice, this page here displays great snow cover anomalies on land next to the Arctic Ocean.